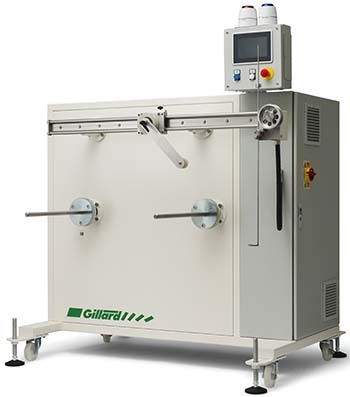 Coiling speed is adjusted by a low tension control system, ideal for delicate products such as medical tubing. Heavier products can be coiled with a dancer arm or a sonar loop control system. Servo traverse control is provided for precise layering & higher speed coiling. A colour touch-screen is standard so all parameters can be easily controlled and recalled from memory. A Lenze 178 mm (7") full colour touch-screen is standard, so all parameters can be easily adjusted and recalled from memory. Datasheet - Horizontal twin coiler (PDF). Drawing - Twin coiler - Model 504/2H-S – horizontal (PDF). Drawing - Twin coiler - Model 504/2HD-S - horizontal (PDF). Designed for smaller flexible tube & profile where a more delicate coil is required. Designed for small to medium flexible tube & profile, where a more delicate coil is required. Simple machines for low-level reeling requirements. A range of reels, drums or collapsible core mandrels are available to suit a variety of extruded products & coiling requirements.